You are going to be so in love with this month’s new Gourmet Rubber Stamps appetizer release .. are you ready?? I used papers from Lawn Fawn and Bella Blvd, inks are from Tsukineko, those index card dies are from Memory Box and the washi tape at the bottom is brand new from October Afternoon. Incidentally, this is also our project of the month…don’t forget to sign up for our newsletter to get directions on how to make this card. This gorgeous butterfly image is one of Crafter’s Companion recently CHA released Stamp It Imagine Range – Birds and Butterflies. I just randomly inked up the background with a brayer and some distressed ink. If you are inspired to make a “love” card – even if you are just loving life like I am, feel free to enter it in this month’s “Love Is In The Air” challenge. It always thrills me to recognize one of my blog reader’s name in those challenges. I hope to see your card there! I’m excited to showcase another new Crafter’s Companion stamp collection released TODAY!! An elegantly beautiful set of florals by Sheena Douglass! Colored with Spectrum Noir markers CT1, CT2, CT3, CT4, GB6. Don’t forget to check the Crafter’s Companion blog for more Sheena Floral inspiration! They make excellent Valentine’s/Wedding/Anniversary & all kinds of love cards that will give you entry to this month’s “Love is in the air” challenge. Angelica and Friends comes to Crafter’s Companion with a bang and a hop! I am totally excited to announce that Crafter’s Companion has a fabulous new release this week – nine new stamp sets and a coordinating CD-ROM. We are celebrating this fun launch with an international blog hop with both the US and UK design teams! Last but definately not least, we will pick one random WINNER on a US team members blog to win these 4 EZ Mount Angelica and Friends sets of our choice worth $40!! US prize is open to US residents only; participants have until Wed, Feb 6 at 9:00 PM PST to enter; winner will be announced on Crafter’s Companion USA blog on Thursday. Leave me a comment to be eligible and Happy Hopping! Gourmet Rubber Stamps welcomes Febuary, Valentine’s Day, a new Design Team Coordinator – Kendra Wietstock, a new design team member – Melissa Cash, a new appetizer set coming out middle of the month and lots of exciting new things that comes with it … Here’s a new card to start. Using the brand new Truffles set – Elegant Valentine. Is anyone trying to multi-task, kill two birds with one stone, crunched for time, etc etc etc? Here is a two-fer challenge for ya! Now that is a very simple sketch and a very gorgeous color scheme … and here is my simple card with a sweet sweet color theme, using the BRAND NEW Gourmet Rubber Stamps Truffles set called Thinking of You. Patterned paper is from My Mind’s Eye and inks generously provided by Tsukineko. Come play with us – you can upload your card to Paper Craft Planet gallery (tag your card “SK012513″ so we can find it) and Gourmet Rubber Stamps facebook page. I didn’t follow the sketch too closely – the vertical and horizontal panel were what caught my eye and I needed to go with the flow … it’s the rebel in me and since I’m don’t get to go to CHA this year, I’m unleashing my inner rebel! and I even left the image uncolored ..take that! The stamp set I used is an oldie but one of my favorite – Clothesline Greetings. Perfect for an every day greeting and there is also another image on that set for a new baby! Check out how my other team mates interpreted the sketch – it’s an inspiration I tell ya! Watch for an entire Truffle collection coming out this CHA! If I had picked out one of the SWALK, Humphrey, Mulberry Wood or Torread stamp sets, we would be here all year! But this is my favorite because I love how even the little sentiment stamps in the set of gorgeous image stamp can create one of my favorite cards and I reach for those tickets again and again (the tickets are blank in the set – I stamped the words in, and they are also part of the set). Really versatile set! Oh and how can I pick and favorite and not give it away!! Head on over to the Crafter’s Companion blog to win my favorite stamp set! The hearts were actually a Gourmet Rubber Stamp Cookie Cutter stencil and the sentiment is from the Happy Heart Day set. I like that it conveys a love sentiment without being too frou frou – perfect for my guy! I used Let’s Celebrate stamp set – check out the link to see the entire set! It’s full of amazing images for all kinds of celebratory events – b’day boy and girl, new year, friendship, cheer up and so much more. I have another non stamped card to share today. They really make easy Christmas cards if you are running short on time – really if you are sending handmade Christmas cards, always remember that for every bow or stamped images you are coloring, you have to take into account coloring or tying a bow another 20, 30 or more times! These paper crafting CD from Crafter’s Companion is truly my life saver. Everything you need you just print out. The one I used on my card is from the Christmas in Mulberry Wood CD. There are 12 different designs in 6 colors, background papers, alphabet and verses sections – almost 3600 printed files that I’m pretty sure none of the Christmas cards you send out from this CD would look the same at all! Best of all, they all look so complete to me that all I did was to die cut 2 stars and adhere it to the card by the spine only to give it dimension and matted the image before attaching it to the card. One and a half more week till Christmas! Are you ready yet? Welcome to Paper Craft Planet Friday’s Sketch Challenge! Here is a simple sketch for a CAS Christmas card! Where are you in your Christmas card making this year? Are you one of the organized ones who already have your cards made and sent or are you still plowing through it as I am. Well, I have about 50 more to go and I’m all for keeping it simple so 50 will go faster. 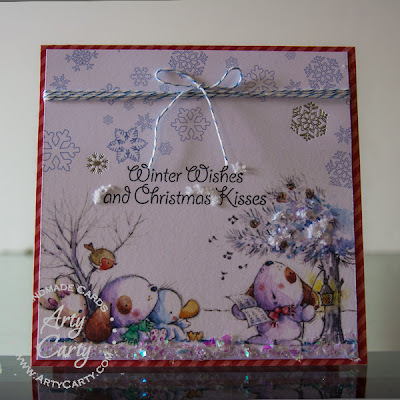 This gorgeous snowy postcard stamp is from Stampendous. I hope you’ll join me and play along… and guess what, I’m all for doubling it up coz there is only 11 days to Christmas. You can also enter your CAS Christmas card to Stampendous December challenge right here. These 2 cuties are from Strawberry Kisses collection – Friends. Colored with my trusty Spectrum Noir markers – GB3, GB5, GB7 (dog); BG3, BG5, BG6 (cat) and PP3, PP4, IG4 (cushion). Sentiment is from the SWALK collection – Deserve a Treat stamp set. Ribbons are from May Arts and paper is from Basic Grey. I hope you get a well deserved treat amidst this holiday season.